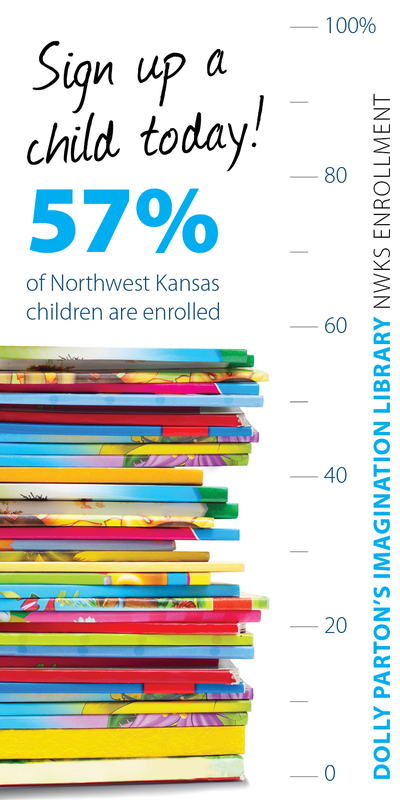 The Hansen Foundation has embarked on a new initiative designed to increase reading opportunities for Northwest Kansas children. The Foundation recognizes that improving the educational experiences of our children, beginning at birth, will lead to healthier communities. Healthier communities have lower healthcare costs, happier residents and more productive workforces. Enriching early childhood reading experiences leads to early language development, school readiness, grade progression, on-time graduation, and higher enrollments for college or other post-secondary opportunities. The more prepared that children are when they enter kindergarten, the less likely they will be held back in school, need special education, or fail to graduate from high school. Children learn more quickly during their early years than at any other time in life. Research has shown that the brain develops 90-percent of its capacity in the first five years of life. Brain development is encouraged by stimulation and interactions in the environment. Being read to daily provides stimulation for increased brain development, which contributes to later academic success and lifetime well-being. One significant element to early literacy is simply access to books. The Hansen Foundation is working to eliminate this barrier for the children in the communities we serve. Research tells us that when books are present in the home, children are read to more frequently and are more likely to learn to read for enjoyment. Every child from birth to age 5 has the opportunity to enroll at no cost in the Dolly Parton Imagination Library and receive a FREE age appropriate book in the mail every month. The Hansen Foundation is pleased to partner with the Dollywood Foundation and our local partners in each county to expand this program in Northwest Kansas. Participating medical clinics and health departments are distributing books and sharing the importance of reading at well-check visits for children age 6 months to 5 years. The Hansen Foundation is pleased to partner with the Kansas Pediatric Association to expand this program in Northwest Kansas. Research shows that once children enter school, they learn at a similar pace. However, children with fewer books in the home, and from lower socio-economic homes, lose precious ground between school years. This “summer slide” creates a gap in reading and math that evolves in the elementary years and remains throughout a student’s educational career. The summer reading grant is designed to specifically address this summer slide. Summer Reading Grant applications for summer 2018 will be accepted monthly through MAY 1, 2018. Applications received by 9:00 a.m. on the 25th day of each month will be considered at the regular meeting of the Hansen Trustees the following month. Watch for information on dates for 2019.